As research proceeds on treatment of the resorbed posterior maxilla, new techniques and innovations continue to be adopted to solve this clinical problem. While the previous edition of this book provided detailed information on the types of grafting materials and procedures available at the time, this completely revised version looks to the future with new strategies for treatment, some of which avoid grafting altogether. 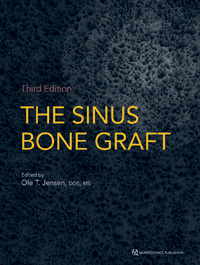 This book not only reviews the time-tested lateral window approach for sinus elevation and grafting but also describes a variety of techniques to approach the sinus transcrestally, with or without grafting material. One section of the book is devoted entirely to the different types of implants and implant placement techniques available, many of which are designed specifically to avoid sinus elevation. In addition to clinical case studies and descriptions of how to perform specific surgical procedures, this book includes discussions on the science of bone formation and how continued research brings us closer every day to the ultimate goal of using tissue engineering to completely regenerate new teeth.